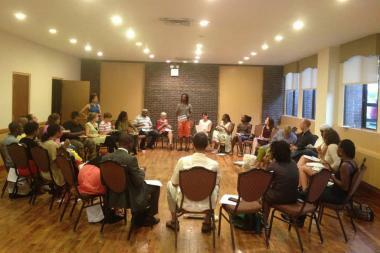 Brooklyn Movement Center Executive Director Mark Winston Griffith addresses organizers at a recent food co-op meeting. BROOKLYN — A local nonprofit is looking to bring a new food co-op to central Brooklyn, with the help of a venerable Park Slope institution. The Brooklyn Movement Center is organizing "the People's Co-op" as part of its food justice campaign, which addresses how the food system in central Brooklyn affects its residents. As part of that campaign, the group has been working with the Park Slope Food Co-op, which is helping BMC get its program off the ground and sending out mailers to its central Brooklyn members, according to BMC Executive Director Mark Winston Griffith. "What we like about Park Slope is that it has a very substantial central Brooklyn membership: a lot of its members come from Central Brooklyn, and it's bursting at the seams," Griffith said. "They've been anxious to find ways to incubate other food co-ops. So it's kind of a symbiotic relationship. By them helping us, we're helping them." Although this is not the first time residents of Bedford-Stuyvesant and Crown Heights have tried to create a food co-op, Griffith said that BMC's resources and staff, combined with the Park Slope Food Co-op's knowledge, finally make the idea a real possibility. The group's food justice campaign, which also includes potluck-style "grub parties," naturally evolved into the idea of a food co-op, said food justice organizer Harvir Kaur. "[BMC] saw a lack of availability of fresh and local food at an affordable price that people could go to the store and buy," Kaur said. "That lack of availability prompted that food co-op process." Since the group has begun planning, they've used their grub parties as a way to recruit organizers for the co-op. At the last meeting, representatives from the Park Slope Food Co-op discussed the workings of a cooperative. Those discussions brought great interest from the community, the BMC organizers said. And although they recognize the success of Park Slope's model, they also want to leave it up to those locals how their system should work. "Park Slope has been very successful," Griffith said. "If you want to pick a model, it's a good one." But, he added, "at the end of the day, the food co-op is going to be created by local members, and it's going to conform to the needs and expressed interests of local folks."